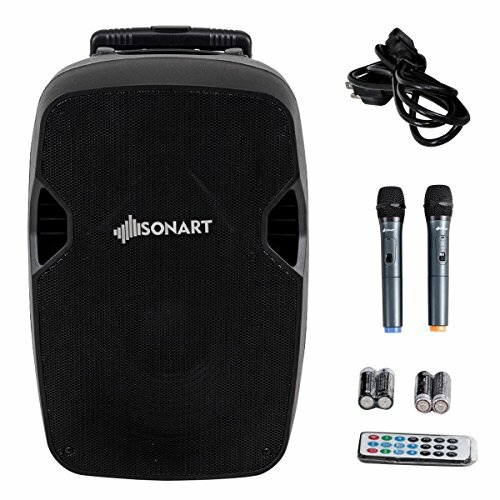 Description: Sonart all-in-one Speakers Set, which is perfect for karaoke, and parties. The system is portable and includes built-in rechargeable battery so it's perfect indoors and out. The extendable carry arm and rolling wheels will allow you to quickly and easily transport the speaker wherever needed. Spread your voice at social gatherings or play your music at the party, either way you'll enjoy the versatility of this Bluetooth Speaker System. Sonart 15" 800 Watts Speaker System. It is highly configured Powered Speaker than most ones in the market. High power long-throw 12'' woofer with 1.5" aluminum voice coil provides incredibly deep bass and acoustic power. High-power 2-way professional sound reinforcement speaker system for live sound and playback applications. Portable Design - Take this powered speaker in 3 ways at your convenience with ergonomically shaped handle for easy carrying and setup. You can carry it at the side side/top, or pull it like a trolley case. Multi-functions-1. With Bluetooth wireless music streaming ability, you can input any audio signal from compatible Phones, MP3 Players, Tablets, etc. 2. USB input for MP3 playback from thumb drive. 3. SD memory card readers. 4. Built-in rechargeable battery which has 5-6 hours battery life. 5. LCD digital readout display. 6. 2 wireless microphones and remote Included. TWO Wireless Microphones offer you great convenience to speak at a wide range. Ultra-low noise. Listen to FM radio freely. You can either set this speaker at ground or set with stands. The socket on the bottom of the speaker is exactly suitable to fit the stand and you can fasten it tightly and stably. If you have any questions about this product by Sonart, contact us by completing and submitting the form below. If you are looking for a specif part number, please include it with your message.